A cat injury comes in many shapes, sizes, and forms. A traumatic pet injury can be the most difficult cat problem to look at and deal with emotionally. Seeing a cat injury sustained too many times by my own cats as well as other outdoor cats was no doubt a major factor in my decision to make my own cats indoor cats. I chose to provide my cats with outdoor cat enclosures rather than continue to see my feline friends continue to get a pet injury or disappear altogether. There are many things that can cause a cat injury if your cat is outdoors. Pets hit by cars, of course, top the list. Other animals, including other cats, can attack your precious kitty and cause extreme harm, even death. Your cat can also acquire feline immunodeficiency virus or feline leukemia virus from other cats outdoors. Pet poisons come in many different shapes and sizes to the outdoor cat. Poisonous plants, anti-freeze, rat poisoning, and many other chemicals can make your cat very ill or even lead to the death of your beloved pet. Cats do not always land on their feet when falling from high places or even if they do, many sustain a feline fractured jaw or worse. Cats sleeping under the hood of a car that is then turned on can end up with severe cat injuries that can even lead to the death of your pet. As a long-time cat lover and feline veterinarian, I've seen all of these things happen too many times. For this reason I keep my kitties indoors. I also have written several articles on such things as Outdoor Cat Enclosures, Cat Doors, Indoor vs Outdoor Cats, and several other topics which you can find here on the Ask The Cat Doctor website. Of course, indoor cats can sustain traumatic injuries also. Cat play can get pretty intense at times. Poor cats health can lead to problems jumping up or down, resulting in a cat injury. I have seen cats that have broken their leg indoors, displaced their knee caps, had their tails or toes broken under chairs or in doors and many other unpleasant occurrences. The following questions deal with cat injury involving cat limbs. My 1 yr old female cat has been limping and favouring her hind end for the past 2 weeks. She sleeps all the time. When I pick her up and place her on the floor on her feet, she crouches down into a lying position and won't move. I can make her walk a short distance, then she lies down. I have to carry her to her food - she eats then "hobbles" or walks 'gingerly' to her litter box. Then she very carefully walks to her nearest coziest destination - sometimes onto a chair, or under a bed and curls up to go to sleep. When I have checked her legs and feet, back and belly, there areno lumps or masses and she appears not to flinch in pain. She just gives me those "god I am cute" eyes and purrs. I took her to the vet this past week and after a complete physical exam including blood tests, he found nothing wrong with her = good temp/ normal blood reading/ no lumps,etc. We figure she just jumped and landed wrong, or fell from her "perch" while sleeping??? and pulled something in her back or her legs. I am hoping that given time (hopefully) not too long, she will be back to her normal self. Of course I did read oneof your answers where you mentioned cat medicines such as steroidal anti-inflammatories. Do you think this would help? Would there be any other type of meds for her like feline antibiotics that would help? My Cat Bilbo, shown in the above picture, recently lifts his right leg. Have checked the leg for swelling or thorns and cannot see nothing obvious that maybe causing him to do this. Any thoughts on why he is doing this??? When you are trying to assess a cat injury, it is frustrating to be a cat owner or a cat vet for that matter. If only our pets could talk to us! Wouldn't it be great if they could tell us where it hurts and tell us what they were doing when it began? Unfortunately, we have to work without that information. Fortunately, most of the time, with good detective work and appropriate exams and diagnostics tests, we find the problem and have a solution. In both of these cases, there's certainly more than one possible cause for the cat injury. - a soft tissue traumatic injury from fighting with another animal or being hit by a car or stepping on glass or other foreign object or landing wrong when jumping down, ingrown nail, etc. - Internal systemic disease such as diabetes, kidney disease, hyperthyroidism, cancer, etc. - inherited or acquired orthopedic problems such as hip dysplasia, displacement of the knee caps, arthritis, bone fracture, cancer, etc. In most cases, if the lameness is mild and all else is well, you can afford to wait a couple of days to see if it is a mild cat injury that is improving. If, however, appetite or other normal body functions are affected, a vet visit right away would be in order. Carol's cat has been examined by the vet and also had blood tests, all of which is very appropriate. Results were normal. In this case, Carol can afford to wait a little longer to watch for improvement. However, I would suggest that she make sure testing included a blood glucose level because the way her kitty is moving around certainly can indicate diabetes. I would also make sure the knee caps were checked carefully for possible luxation. Many cats have knee caps that slip in and out of place. A cat injury may also involve a fracture or other trauma in the hip/pelvis region which also came to mind when Carol described her cat's way of walking. If improvement is not seen, X-rays would certainly be the next step. Meanwhile, Carol asks about medication. In case of inflammation from a cat injury involving soft tissue, or swelling around even bony trauma, an anti-inflammatory could very possibly be helpful. 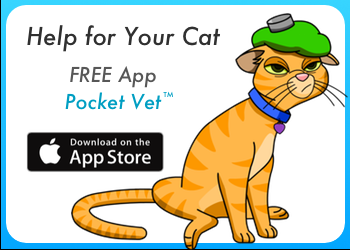 Do not medicate your cat without talking to your veterinarian directly for dosage, etc. Prednisolone is commonly used in cats as a steroidal anti-inflammatory. A non-steroidal anti-inflammatory can be very dangerous in cats. DO NOT give your cats Advil or Tylenol or anything like that. The ONLY non-steroidal anti-inflammatory that can be used in a cat is a VERY LOW DOSE of aspirin, but only with your own vet's knowledge and advice! Aspirin, also, can be DEADLY to cats if given too often in too large of a dose. Never give more often than every 3rd (THIRD) day and never give more than 80-85 milligrams (one baby aspirin) for the average size cat. Warren's cat, Bilbo, could likewise be suffering from any number of traumatic or non-traumatic causes. There's not a lot of detail in the question, but it sounds like it is only one leg and it sounds like he is sometimes holding it up, but not that he is walking without ever using it. If that is the case, it sounds most like a soft tissue injury from a jump, or stepping on something, or even a bite from another cat if he goes outdoors. Cat injury from another cat's bites can cause lameness for up to 2 weeks without any other outward signs until an abscess fully forms and the wound is then noticed. Ingrown nails can also cause lameness or discomfort in one paw. Always check your cat's nails carefully. Warren has examined his cat, but if this is not improving I would certainly suggest a visit to the vet. Again, there are too many possibilities for anyone to say what is bothering either of the two cats without seeing them and running tests. Last, but not least, this is a perfect place to suggest you keep your cat indoors if at all possible. So many traumatic injuries would not occur if your cat was indoors. If you feel your kitty must have outdoor time, look into outdoor cat enclosures. They give your cat outdoor time, but safely.